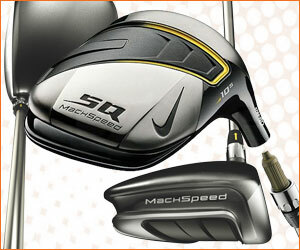 Today only, save over 75% on the Nike SQ MachSpeed STR8-FIT Driver golf club for only $69.99 (suggested retail $300.00). 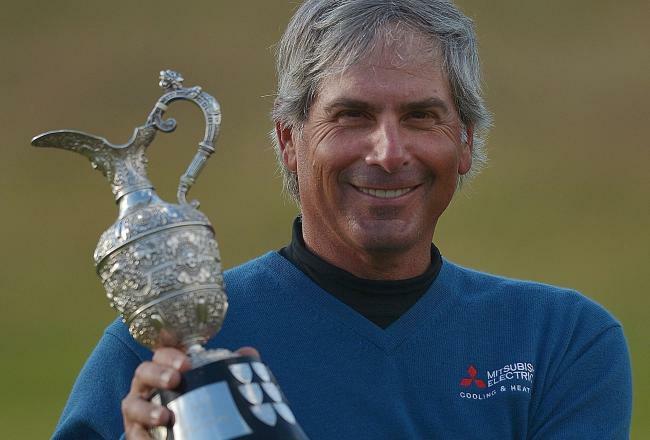 In his first attempt at the Senior Open Championship, Fred Couples achieved what he could not on the PGA Tour – he takes home a claret jug. It’s not the same jug that Ernie Els won two weeks ago, but it’s the next best thing. Couples closed out his final round with two consecutive birdies to break a tie with Gary Hallberg and win the Senior Open at Turnberry, site of many historic moments in major championship history. Couples now has his own. The victory was his eighth Champions Tour victory and his second major championship, having won the Constellation Energy Senior Players Championship last year. And the win is his second of the year on Tour. Couples broke a tie with Hallberg when he two-putted from 35 feet for birdie at the par-5 17th after Hallberg made a birdie of his own there to forge the tie. Couples hit the par-4 18th with a 3-wood and a sand wedge and needed but two putts to win. However, his putt from 30 feet found the center of the hole for the final margin. The winner shot a 3-under 67 in the final round to post 72 holes at Turnberry at 9-under 271, which included a 6-under 64 in the third round. Beginning the day at Turnberry, Couples found himself in the final pairing, one shot behind 54-hole leader Bernhard Langer. The whole tournament turned in one hole, the par-4 12th. Couples hit his approach in close for birdie, but inexplicably, Langer suffered a double-bogey and surrendered the lead for good. “That was a big swing and I looked at the board and Gary Hallberg was making a couple birdies so there was no time to relax,” Couples said. And, indeed, Hallberg was coming fast. Hallberg had led after 36 holes when he posted a 7-under 63, the best round of the championship. But he stumbled back in the pack after a third-round 73 and was four back of the lead coming into the final day. But he turned the outward half in 2-under 33 and birdied the 13th to get to 6 under. He temporarily tied Couples at the 17th with a two-putt birdie from about 30 feet. For the second straight senior major championship, Langer lost a final-round lead. At the U.S. Senior Open, he led by four in the final round only to lose to Roger Chapman. He led on Sunday after the front nine but went 5 over in a five-hole stretch starting with the double-bogey at the 13th and stumbled to a 75 in the final round. 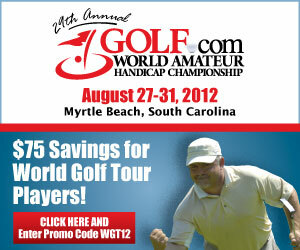 Don't miss the 2012 World Am Golf Tournament in Myrtle Beach from August 27-31, 2012 for your chance to become the next world champion. As a WGT Partner, Myrtle Beach Golf Holiday is offering a special discount to WGT players who are interested in playing in the World Am, a real-world amateur golf tournament that includes 72 holes of net stroke tournament play on a different course each day. Join more than 3,000 golfers from all over the United States, plus 20 foreign countries in Myrtle Beach, South Carolina for the ultimate golf experience. In addition to a fun week of golf competition, enjoy nightly parties that include local food, drinks, live entertainment and more. The last day to register is August 7, so sign up today! Last week during the British Open, we hosted the WGT St Andrews Championship on World Golf Tour. The free online golf tournament was a single-play, multi-round tournament with a special weekend cut line. Open to play all week, players posted their first round scores by Friday and the top 50% of those scores moved on to the weekend championship rounds. Second round scores were posted on Saturday and third round scores on Sunday, to finalize the leaderboard. The Top 10 combined scores overall each won an Amazon gift card as a prize. Congratulations to our winners, and thanks to everyone who participated! There are still more chances to join our Summer Tournament Series with opportunities to win great prizes, so be sure to stay tuned for more information. In the end, it was one of the most emotional Opens of them all. 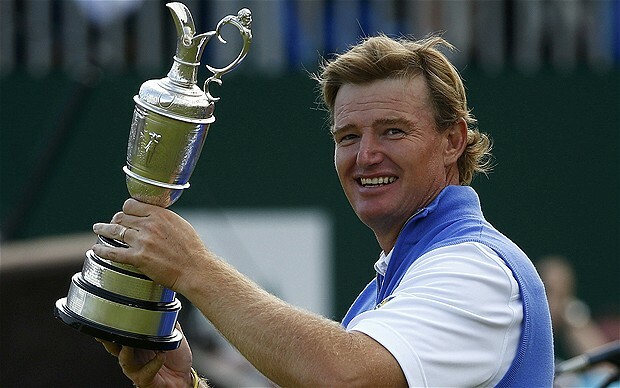 The 42-year-old Ernie Els, who won his second Open 10 years after his first, had laughed out loud when he holed a 12-footer on the home green to go to 7-under par. Perfect putt though it was, he could not believe his luck. When he left the green, he was hoping at best for a playoff. After all, his good friend, Adam Scott, had been six ahead of him at the turn and still had shots in hand. Out on the course, Scott had just made the kind of birdie on 14 – he holed from 15 feet – to suggest he soon would be holding the Claret Jug. All day he had been careful with his putts rather than aggressive but he had rammed this 15-footer into the hole and it was precisely what the crowd wanted to see. This was the stuff. The Australian could afford to drop a shot at the 15th but he could not accommodate so easily what happened at the next. Though Gary Player had talked on Saturday of how the long putter is unfair in the way it takes nerves out of the equation, Scott missed from three feet. His lead was cut to two and the massive roar that greeted Els’ holed putt at the 18th came as no less of a blow. Scott composed himself to crack a good drive from the 17th and as Steve Williams, his caddie, marched out with his long and confident stride, there was the feeling that the two of them were going to be all right. Then came what Scott would describe as the killer blow; a second that he turned over to leave himself chipping out of the heavy stuff to the left of the green The recovery was pretty good in the circumstances but he dropped a third shot in a row to mount the 18th tee on the same 7-under tally as Els. At this point, Els was standing on the practice putting green having turned down the R&A’s invitation to watch Scott’s finish on television. He ate a sandwich, he talked to his wife on the phone and, throughout, he looked shocked and bemused in turn. As he settled down to practice his putting – his caddie, Ricci Roberts, had arranged a circle of six-footers for him – so news came of how Scott had driven into sand at the last. It was one more of those Lytham bunkers that, earlier in the day, had served only to interrupt the flow of play and drain the afternoon of much of its excitement. All Scott could do was to exit the trap and hit for the green with his third. He was bang on target but left himself with a 10-footer to force a playoff. Once again, his long putter let him down. He went down on his knees as the ball missed and shook his head at what might have been. Back on the putting green, Els and Roberts had a brief hug but, thrilled though Els was for himself, he was shaken to the core by what had happened to Scott. At the prize-giving, he talked about the importance of Nelson Mandela in his life, but first he addressed his “buddy,” Adam. Afterwards, Els would add that he had seen everything in his 23 years on tour and had been on the losing end rather more than he had been on the winning end. In his post-round interview, Els touched on the degree to which he had been affected by his 10-year-old son’s autism. He and his wife, Liezl, have raised in the region of £10 million for their Els for Autism Foundation and are shortly to open a new centre in Florida. Els said he made lots of his putts – he had four birdies in his inward 32 – with Ben in mind. 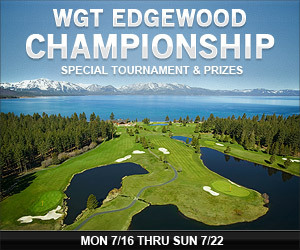 This week during the American Century Championship Tahoe Celebrity golf tournament, play the free WGT Edgewood Championship virtual golf tournament for your chance to win a golf trip to Edgewood Tahoe. One lucky sweepstakes winner will win a golf trip for two people to the Edgewood Tahoe golf course, including air, two nights at the Edgewood Tahoe lodge and two rounds of golf. Enjoy this beautiful golf course located on Lake Tahoe and close to Nevada casinos and entertainment. This is an unlimited play, closest-to-the-hole free tournament with one sweepstakes grand prize, open now thru Sunday, 7/22. Don't miss out! Celebrity golfers competing at the annual Tahoe Celebrity golf event include Charles Barkley, Michael Jordan, Oscar De La Hoya, Aaron Rodgers, Dan Quayle and many others. Check the Golf Channel and NBC for your local TV listings or visit the official tournament site: http://tahoecelebritygolf.com/. See WGT tournament rules for eligibility and prize details. 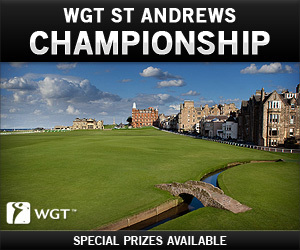 The WGT Summer Tournament Series continues with the WGT St Andrews Championship tournament this week during the British Open. This special tournament is a single-play, multi-round, free online golf tournament with a special weekend cut line. Post your first round by Friday, 7/20 and the top 50% of scores will advance to the weekend rounds. Qualifiers will need to post their second round on Saturday, 7/21, and third round on Sunday, 7/22. The Top 10 combined scores overall will win Amazon Gift Cards. And while you're playing, don't miss all the 2012 British Open action, played at Royal Lytham & St Annes Golf Club this weekend. Check the Golf Channel, ESPN and ABC for your local TV listings or visit the official tournament site: http://www.theopen.com/. See WGT tournament rules for eligibility and prize details. Good luck! A hometown hero's welcome was ringing across the 18th green Sunday for Iowa native and presumptive winner Zach Johnson when he heard a sudden, competing wave of cheers one hole back. A dramatic 60-foot eagle by third-round leader Troy Matteson would set up an eventual playoff, but Johnson would produce a stunning shot of his own on the second extra hole to win the John Deere Classic. Bunkered on the left side of the fairway for the second time in a row on TPC Deere Run's 463-yard par-4 18th, Johnson drilled his 6-iron approach shot 194 yards to within a foot of the hole. His tap-in birdie gave him his ninth PGA Tour victory, courtesy of his best career comeback. He trailed Matteson by four strokes to start the final day, and by overcoming that deficit he bested the three-stroke comeback he used to win the 2007 AT&T Classic in Atlanta ... also over Matteson. His second title of 2012 (after winning at Colonial in May) yielded an $828,000 payday and resulted in a jump to second place in the FedEx Cup standings, just 32 points behind leader Tiger Woods. "It is (very emotional)," he said of winning his "hometown" event, for which he serves as a board member. "This tournament means a lot to me, a lot to my family. And it means a lot to the PGA Tour." For Matteson, there was one very tangible consolation prize. By reaching the playoff he earned the final spot in the field for this week's Open Championship at Royal Lytham & St Annes. Scott Piercy was third at 18 under, and Aussie John Senden was another stroke back in fourth place. Johnson birdied Nos. 13 and 14 to get to within a stroke of Matteson, then picked up the lead when the seventh-year pro made double-bogey on his 15th hole. His 15-foot putt from the fringe on No. 18 would have placed him at 21 under and avoided the playoff, but it slid inches to the left. Both players had found water and made double-bogey on a back-and-forth first playoff hole. It was the first playoff at the event since 2008, which also was the last time any player other than Steve Stricker had won at Quad Cities. Kenny Perry used two extra holes that year to beat Jay Williamson and Brad Adamonis. Stricker was in contention on the final day, but struggled on the back nine and shot 1 under to finish at 16 under overall in a fifth-place tie with fellow University of Illinois alumnus Luke Guthrie. With the U.S. Open champion in the final group with the contenders not too far removed from the Web.com Tour, you’d think that the result would be all too predictable. At the Greenbrier Classic, it was anything but. While Webb Simpson faltered down the stretch, PGA Tour rookie Ted Potter Jr., came away with the title on the third hole of a playoff. Potter won his first Tour event over fellow Web.com Tour traveler Troy Kelly and, in the bargain, both Potter and Kelly made it into the Open Championship at Royal Lytham and St. Annes next week. Potter finished regulation with his second-consecutive 64, including an eagle-birdie finish to come from nowhere into the playoff with Kelly, who took the lead on the back nine on Sunday over Simpson. 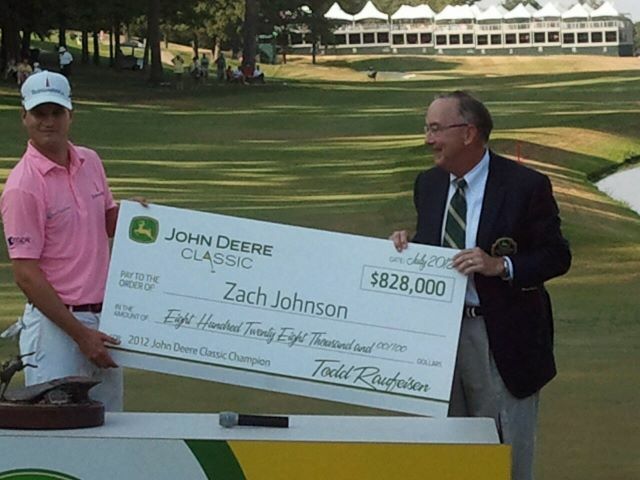 Both players finished 72 holes at 16-under 264 on the par-70 Old White Course at the Greenbrier Resort. Potter had a chance to win the playoff on the par-5 17th, the second hole of the playoff when he missed a five-footer for birdie while Kelly made a 22-footer for par. Then on the par-3 18th, the third playoff hole, Potter hit his tee shot to four feet and made it for the victory. Potter had missed six of his previous seven cuts, including his last five in a row. Potter, who won twice on the Web.com Tour last year and finished second on the money list, tied for 13th at the Sony Open in Hawaii in January but had made only five other cuts in 15 starts prior to the Greenbrier. Kelly, who finished 11th on the Web.com Tour last year, had only made six cuts in 14 previous starts and his best finish was a tie for 37th at the Mayakoba Golf Classic in Mexico in February. Kelly shot an 8-under 62 in the third round to get into the final pairing with Simpson, who led after 54 holes at 14 under. But it was Simpson who faltered down the stretch, making four bogeys on the final nine to fall from the lead to a tie for seventh at 11 under. The Greenbrier is the personal graveyard for Simpson, who shot 73 on Sunday. Simpson stumbled on the final nine on the final day last year to lose to Scott Stallings. Another unheralded Tour rookie, Charlie Beljan, shot 62 in the second round and finished tied for third at 14 under with Charlie Wi, who fired 65 in the final round, while Beljan posted 67. Daniel Summerhays posted 64 on Sunday to finish fifth at 13 under. Fourteen years ago, a young Na Yeon Choi watched Se Ri Pak win a major championship on television, and hatched the idea that she could do the same one day. This weekend – playing in the same tournament and at the same venue – Choi posted an historic third-round 65 to take charge, then gutted her way through a potentially disastrous moment Sunday to make good on that dream. Choi won the 67th U.S. Women's Open at Blackwolf Run, the first major victory for the 24-year-old South Korean pro who already was firmly established as a legitimate heiress to Pak's Hall of Fame legacy. The victory came by four strokes ahead of countrywoman Amy Yang, and earned Choi $585,000. It followed So Yeon Ryu's win in this event last season, and was the fourth in five years for a South Korean player at America's national championship. Choi’s score of 1-over on Sunday left her at 7-under 281 for the tournament at the steamy and occasionally breezy Pete Dye course. Yang's 3-under 285 was the only other 72-hole total that beat par, and was three strokes better than Sandra Gal. South Korean players now have 12 LPGA major victories since 2001, two more than U.S. players in that span. By the mid-point of Sunday's final round, it seemed as if Choi was on her way to a coronation. Her lead on Yang was five strokes – only because Yang had just birdied No. 9 – and there was no sign of trouble. But she pulled her drive drastically off the tee at No. 10. A 15-minute episode unfolded as Choi, caddie Shane Joel, tournament marshals and even USGA president Glen Nager attempted to find the ball or make a ruling on where she should play from. As she returned to the tee, a sense of vulnerability seemed to materialize from out of the Wisconsin wind. A score of triple-bogey 8 resulted, and Choi's lead suddenly stood at two. But a bounce-back birdie on No. 11 helped her stabilize things. Then she drained a pair of putts for scrambling pars after flirting with water and weeds on Nos. 12 and 13, and birdies on Nos. 15 and 16 brought a little bit of comfort back to her triumphant day. "I had the triple-bogey on 10, and after that I tried to forget it," said Choi, who moved to No. 2 in the world rankings. "And then I had a really good bounce-back on 11, and I had a really good save for par on 12. So I got some momentum from 11 and 12 and then I kept it going until the 18th hole." Saturday's 65 had put Choi in control in the first place. While second-day leaders Suzann Pettersen, Michelle Wie and Cristie Kerr all tumbled from the top of the leaderboard, Choi compiled the third-best round in Open history, behind Helen Alfredsson's 63 in 1994, and a trio of 64s in 1999. It gave her the best 54-hole advantage since Amy Alcott led by eight strokes heading into the final day of her 1980 Open victory. "That was one of the best rounds that I've ever seen, and I've seen some good ones out here," said Choi’s Saturday playing partner Nicole Castrale. In her last outing in a major, last month's LPGA Championship, Choi had a much less memorable moment. She was in contention for the first two days at Locust Hill CC near Rochester, N.Y., but struggled with a final-round 74 to earn a T19 finish. She didn't even get to count that on her record, however, after leaving the event without signing her scorecard. The resulting disqualification also cost her nearly $30,000 in winnings. The beginnings of Choi's career have been much more reflective of the example set by Pak, her idol. She was second to Yani Tseng in Rookie of the Year voting in 2008, earned her first LPGA win in '09 at the 20-player Samsung World Championship, then was the tour's money leader in 2010. Her previous best at a U.S. Women's Open was a T2 (with Pettersen) in 2010 at Oakmont CC behind winner Paula Creamer. She was competing on the level that Pak allowed her to dream about. "Before Se Ri Pak, my dream was just being a professional golfer (in South Korea)," Choi said. "But after watching her, she really inspired me for being an LPGA player. I really appreciate Se Ri Pak. She is a legend in Korea." At the end on Sunday, there was Pak with a collection of other South Korean players, waiting with bottles of champagne off the green at No. 18. Choi got drenched in the celebration, and then further payoff came in the form of a hug from the woman who inspired her. "I really like that I can continue that feeling from 14 years ago, what Se Ri did," Choi said. "I think I'm pretty proud of myself."